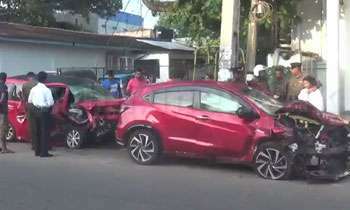 Police informed court that though the breathalyzer test had confirmed that the lady doctor involved in the Boralesgamuwa accident was under the influence of liquor, the doctors who examined her said it was not so and that there were no provisions to challenge the doctors' report. Specialist doctor Nilani Gunawardane was not produced in the Magistrate’s Court yesterday because according to a medical report submitted by prison officials she was not in a good health. They informed court that she was under treatment at the Kalubowila Hospital under the custody of prison guards. The Court was also informed that the deceased Police Inspector’s two children were under treatment while his wife was still unconscious in Hospital. Attorney Sumeda Mahawanniarachchi said the doctor was not suffering with a serious ailment and if she was granted bail, it could lead to public unrest. Nothing to worry. She may go Scott free. Just release the video footage of her at clubs. Rest of the world will ensure she has no future in SL. If you look at the CCTV closely, you can clearly see she is having a Plane Tea. I wonder whats wrong with these doctors in Sri Lanka? We dont need thugs in medical profession fire those rascals. Hi Scooby doo. Here in SL we have thugs in every profession just because every profession is a cross section of our society.Medical field is not different . Usual low down tactics of GMOA doctors. Surely there must be something that needs be done with evidence which was shown on TV of the doctor at the party and the obvious favouritism of the Doctor at Kalubowila as this is a serious case where a man has lost his life. It is in these instances the aggrieved party takes the law into his or her hand against this grave injustice. If Police are powerless where their own officer has lost his life and justice cannot be enforced due corrupt doctors, what is there for the common man to look to justice. I thought only cheap politicians break and send the law. surprising to see so called top professionals also break and bend the law in Sri Lanka. so we have to wait until God makes the judgement. Well, public should not allow a Drunked doctor gettaway with Murder!!!?? Should dismember her arms!!! Yeah!! So She won't be able to drive again!!!?? Country needs an independent panel, Without the doctors / GMOA influence. What the Police did not do was to take a blood sample or urine sample from the doctor. All these would have proved the doctors statement. Still they can proof by cross examining the Dr who issued the certificate to provide the material used to check if she had consumed liquor or not. The tragedy of the accident is almost forgotten and it has become a stand-off between the two corrupt institutions in Sri Lanka,the Police and the Doctors. Throw those breathalyzer to garbage! Pay damages to all poor people who were covicted based on previous breathalyzer tests. Or simply stop up using these things on doctors even they looks drunk up to their eyeballs. Why is the omnipresent GMOA silent. They should stage a strike on behalf of the aggrieved party. GMOA knows how to product false evidence. They are experts in this. Lol, above doctor is not even a member of GMOA. Typical looser's mind. Someone should take matters into their own hands and punish this debunked murderous doctor!! Yeah!! The victim widow has to race the kids without the father!!! This type of crimes can't go unpunished !! Period!!! As always, we have the jungle law for the powerful and another set for the poorer and needy. Justice will only dealt with for the later. Take her to show her hidden weapons?? Otherwise no law and order can be maintained in srilanka. If the victim was NOT a police officer but a normal tax payer, this case would have been long finished and forgotten. Shameful how doctors abuse their authority to justify murder. Why is she still being "treated" if she has no major injuries? She is apparently down with life long influenza and memory loss. HORAAGE AMMAGEN PENA AHANDA YANNE MONA BOORUVODA ? Now I have to agree that GMOA is the most dangerous Mafia in SL. The physician who examined the drunken woman must have been drunk at the time of testing. That is why he/she did not recognize the liqueur smell coming out from the woman. Instead, he/she may have mentioned in her report that the victim-police officer was under the influence of liquor. This called Karma that means every action have reaction. When Police Trocher piblic, then doctors giving reports to favor of police, This time it was being reacted against police. Good country. One dead body and another in serious condition no one is taking responsibility. You don't need any provisions to challenge the doctors report. It is important to understand the time lapsed between the accident took place the time of the breathalyzer test and the observation/examination by the hospital doctor. Each passing hour the BAC would become less. Though it may appear the person is not physically drunk she may have an unacceptable level of BAC and could be legally drunk, that is what is needed. The manufacture of the breathalyzer should have the test data gathered in the trial tests conducted to determine the accuracy of the breathalyzer, these data is a key factor in proving the reliability and the accuracy of these tests. They would also have the comparison charts data for BTA Vs breathalyzer tests. These are considered medical instruments has EU/CE and or US/FDA certification. No legal basis for challenging the accuracy of a medical instrument. කළුබෝවිල දොස්තර ඔහුගේ වාර්තාවේ ගොරකා දඩමස් කොට ඇත. දැනට රටේ පවතින Zig -Zag නීතිය අනුව මියගිය නිලධාරියා බීමත්ව රිය පැදවුවා යැයිද මත පලවිය හැකිය. අවසානයේදී "වංගෙඩිය මිනි මරා ඇති" බවට නිගමනයද විය හැකිය. This bloody doctor is no better than our politicians, DMT is also responsible for doctors they bend the law and pass the driving test. Sure this is a duty free permit vehicle, she ruined a family in a matter of seconds, should rot in hell. Shame on doctors at Kalubowila hospital who gives bogus medical reports to safeguard this notorious women of same profession. They could safeguard her by giving such reports but she won't escape when the God's punishment come on her way. Strange law, doctor's report cannot be challenged. It is obvious that doctors support each other. Give the blood sample to SAITM. Is she a member of GMOA? Where is this so called Buddhist Clergy, who is hell bent to demand justice on BBS leader? one asp in ambilipitiya pushed young father to death for not giving 2 bottles of arrack as bribe to not disturb family party at home.is this asp also in hispital recieving treatment?.or allready hanged for murder ?. Nobody can take the law to their own hands. Let the learned judges decide. If you accepted the Duminda Silva verdict you should be prepared to accept this one as well. You can’t just accept what you like. Everything has to happen within the provisions of the law and not on public emotions. If there is no conclusive evidence the doctor was drunk, how can we say she was? Everyone is innocent until proven guilty. Evidence was there, but, some professionals did not notice it deliberately. These very professionals, if they had acted impartially could have done a far better job. I thought bail is decided on the type of crime and not on emotions of the public. To all who want to see doctors hang, just remember you never know when you’d need a doctor. And this doctor is one of less than 10 specialists in her field, who stayed in the country. She would’ve saved thousands of lives. But all you see is the one which was inadvertently lost. That doesn't pave the way to release her after committing a horrible crime like this.